If you are new to this website, welcome. What is this place ? You are concerned, you want to know more. You want to know what you can do. Well then, first you have to overcome the temptation to simply look away, to push the problem to the back of your mind. Talk To Action can help you with that : Talk To Action can help you continue to pay attention. If you sign up for a free account on this site, you can opt to receive daily, weekly, or monthly summaries of the stories that appear on this website. Many of the themes and issues covered by Talk To Action contributors have never before been written on and discussed in a sustained way or with the intensity and unflinching attention you will find here. Talk To Action is an online publication, and a forum for discussion, that is focused with unparalleled intensity on the rise of the Christian right as a social and political force - and on what those who are opposed to that movement can do to counter it. Welcome. I hope you'll come back soon. Oh - one more thing : what was that picture ? Well, look below - there's a larger version. 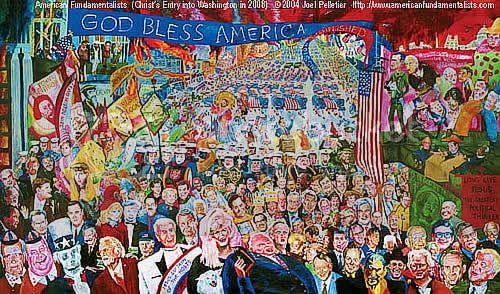 It's an astounding painting on leaders of the Christian right by artist Joel Pelletier. Joel's been travelling around the US with the painting giving talks on the Christian right movement. Here's his website. You can buy a poster of his painting there.